Early in the evening on 6th February 2013 H&F’s council leader phoned me to announce the Conservatives were leaving the cross-party, residents led Save Our Hospitals campaign. 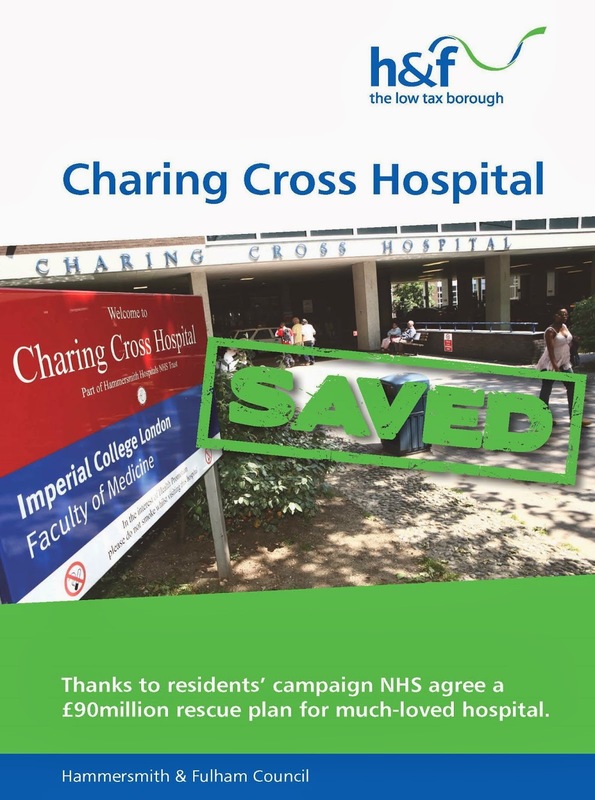 The next morning glossy council leaflets flopped through the letterboxes of every household in the Borough claiming Conservative councillors has "saved" Charing Cross Hospital. Within a few days it turned out that was blatantly untrue. The deal they had actually struck with their government colleagues was that just 13% of the site will remain but as a GP-led clinic. They also signed up to a disturbing plan that if allowed to go ahead, will see the rest of the Charing Cross Hospital site sold off, demolished and developed into luxury flats targeted at overseas property speculators. 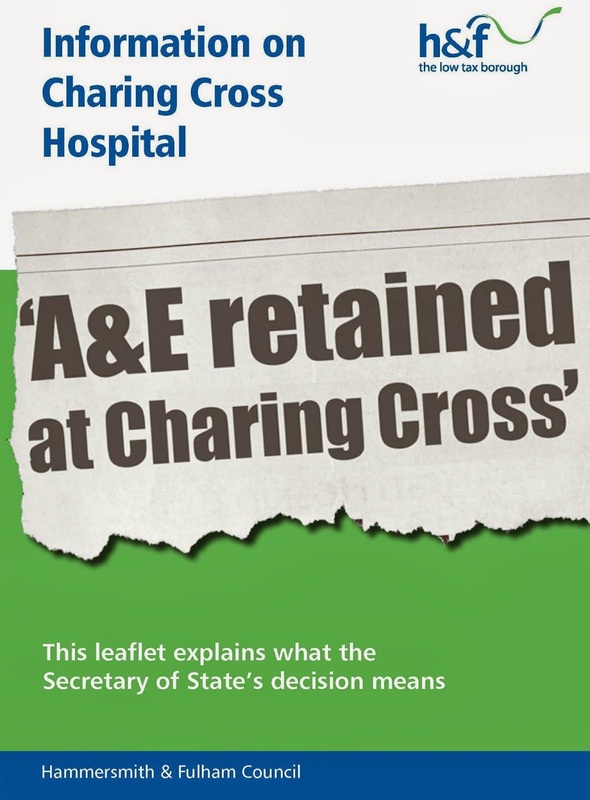 Later that year, the Conservatives pulled a similar stunt again and another Council leaflet was sent out this time proclaiming they had “retained” the Charing Cross accident and emergency department. That was not true either. This A&E won’t actually take any blue light emergency ambulance cases. In other words this accident and emergency department won’t actually deal with emergency treatment. Misinforming residents like that is negligent and puts lives at risk. The first news I got that the Borough’s Conservative councillors were in talks with their government colleagues and had agreed a secret deal came in mid-December 2012. It came from a journalist whom they had briefed. It was evidently also widely known in the Conservative group. It is therefore hard to understand why the Health Select Committee chair, Ravenscourt Park Councillor Lucy Ivimy (Con), did not call an emergency Borough Health Select Committee to review her Administration's plan at any point before it was announced in February 2013. ﻿When eventually we did get to the next scheduled Health Select Committee (which I am a member) meeting, Conservative councillors voted to block an independent enquiry to see if their deal would be in the best interests of local residents. I managed to get the Select Committee to vote for a ballot of all H&F’s GPs on the Conservatives' proposals. That was later overturned by Cllr. Marcus Ginn (Con), the Borough’s Cabinet Member for Health, who argued against it and refused to allow the Council to back the ballot. Local hospital doctors will tell you that there is already a lack of acute care beds. There is clearly no good reason to cut another 450 acute care beds from Charing Cross - which is what they plan to do. Demolishing Charing Cross Hospital and selling off the majority of the site at a time of a projected two million increase in London's population is careless at best. Residents tell me they want a council that will campaign with them to defend Charing Cross Hospital and protect our local health services. Elsewhere in London other Councils are successfully doing precisely that. It is important we let people know what is actually happening and what is at stake. The final decisions on the future of Charing Cross Hospital will not be made until later this year. Who people trust to best stand up for their NHS will be decided in the local elections on 22nd May. Once again the snide Tories are going behind everybody's back trying to push this through. I suggest at the election H&F residents get rid of them once and for all.